Scott Murphy and Dave Hagler doing an Osmosis demonstration. The reports are in, and all indications are that our first Osmosis Clinic from Indian Wells succeeded beyond expectations. 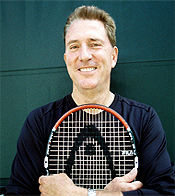 Tennisplayer subsciriber and Osmosis participant Bob Farese put it this way: "The Osmosis Clinic was a fantastically fun time. 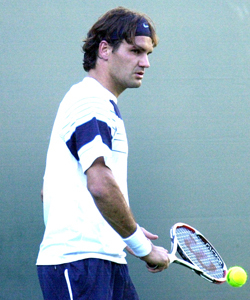 It was particularly great way to be introduced to being at a big tennis tournament." And Dean Moore summarized: "Super fine and super fun." So what was so great about it? The premise of the Osmosis Clinic was a little different than most clinics. It's not the number of balls you hit, it's the quality of the balls you hit, and the quality of the information you absorb. And one powerful way to facilitate this is to watch the phenomenal stroke production of the world's best players at close range at one of the world's premier pro events. It also doesn't hurt if you get to stay at a trendy boutique resort at a discount price. Then you back that up with some focused technical teaching from some of the country's most knowledgeable teaching pros. Speaking of which, I was phenomenally lucky to get Scott Murphy, Dave Hagler, and Giancarlo Andreani--names that are probably familiar to Tennisplayer subscribers--to help me staff the clinic. I thought the 4 of us made a really well-balanced team. The on court chemistry was great, with a lot of great ball striking, and some pretty good banter as well. Talking it over at the Tennis Garden: Jim Farese, Scott Murphy, John Yandell, Jimmy Strinka. So what exactly did we do to create the alleged "osmosis effect"? Well first we started with a celebrity appearance and a book signing with legendary coach and Tennisplayer author Welby Van Horn. 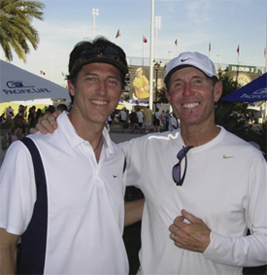 Welby just published a book called; "Secrets of a True Master," written in collaboration with Tennisplayer Contributing Editor Ed Weiss (who also attended the event). More on that later--we're going to have a special offer on Welby's book for all our subscribers. During cocktails we had a copy of the book for everyone hot off the presses, which Welby then personally autographed. We followed that up with a 4-course private buffet dinner in the historic Mafeo room at the Parker, a free standing building in the middle of the hotel's desert garden that looks like a miniature Monticello. After dinner I gave a new high speed video presentation, similar to the ones I give at coaching conventions around the country. But this one was geared toward practical stroke issues faced by our subscribers, looking at the core elements in all the strokes across the grip styles and stroke types. 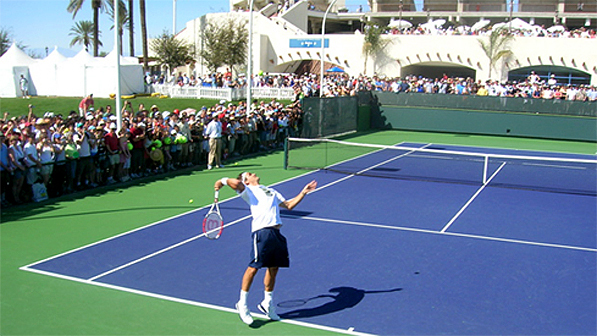 Our goal was to create a framework for absorbing technique from pro tennis for the avid club or lower level competitive player. Steve Hamilton's perfect execution of the backhand volley model. For example, we broke the forehand down into 3 key positions: the turn, the hitting arm position, and the extension of the swing. We looked at how these elements run through all the pro forehands, from the classic to the extreme grips. We also looked at hand and arm rotation or the "windshield wiper" and saw how that applied or didn't apply depending on the ball. The idea was to identify the actual physical positions in the strokes with clear checkpoints that our participants could then create for themselves on the court. And that's what we did starting the next morning. We went out on those beautiful red clay courts at the Parker and worked on executing the core elements in the swing patterns. Everyone also got the choice of one stroke for video analysis, so they could compare their execution to the model positions. Then at the end of the morning we headed out to the matches. The goal was now to reinforce everything we'd learned by watching and absorbing the same positions in the strokes of the top players. Everyone got a day ticket and an evening ticket for Saturday. Then we repeated the whole process on Sunday. Hit the courts in the morning, and then out to the Tennis Garden. I also gave everyone my own personal reviews of my 3 favorite desert restaurants, because, you know you have to eat sometime. How much does Rafael extend on his reverse forehand? So how did that osmosis thing really work? Well, for example, we all had the chance to see Rafael Nadal play his first match on the big stadium. In the video presentation the first night, we saw how his forehand grip style was best suited for playing high, heavy topspin balls, with contact at shoulder level and both feet in the air. We saw that this was very different than the type of ball most club players ever face. But what we focused on was the core elements in his swing that any player could emulate. These are his full body turn with the left arm stretched across the baseline, and the incredible forward extension on his swing, even on many of his so-called reverse forehands. These kinds of points are critical to understand when you watch the top players, and difficult to see with the naked, uneducated eye. 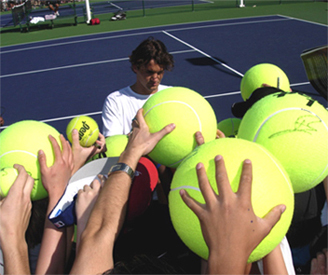 Once you know what to look for though you can see them and actually feel them when you watch Rafael. You can then imagine yourself coiling and hitting through the ball in the same way, even if you have a totally different grip style. 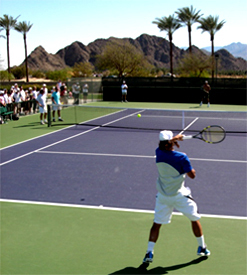 Above Left: the forehand turn Above Right: the windshield wiper finish. That's just one example of how it works, because the Pacific Life Open is an overflowing cornucopia of elite stroke production, with every technical and tactical style you can imagine. Who was out there over the first two days of the tournament? Well name any player in the top 50 (with the exception of a few of the women), and all of the exciting young players like Novak Djokovic, Andy Murray, Marcos Baghdatis, Richard Gasquet, Sam Querry, Anna Ivanovic, Anna Chadvatadze, and the list goes on. And oh yes, Roger. He was there too. 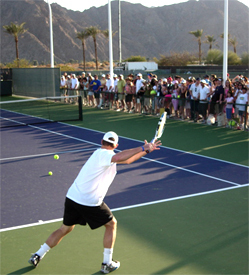 No doubt the high point for our man Scott Murphy was standing there in the front row watching Roger on the practice courts, something quite of few of our guys were able to catch, including Bob Farese who documented it for us with the stills you see here. Tennisplayer's digital still photographer Greg Swendsen--yes, another Osmosis attendee--was there to capture the emotional dynamics of a rare Roger loss. The result is a fascinating portrait of Roger in Defeat this month that you may want to check out as well. (Click Here.) You can learn something at pro events in many ways, and some of them are always unexpected, and that's a big part of the fun. The Tennis Garden: gorgeous by day and gorgeous by night. 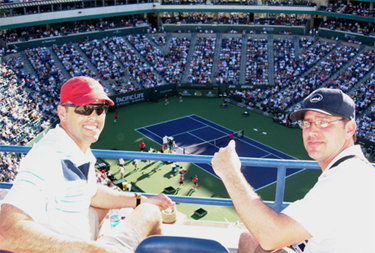 As I have written over the last couple of years, Indian Wells is an amazing wonderland for tennis lovers. The occasionally fickle desert weather cooperated incredibly well, with clear, hot days, warm nights, and no hail, desert winds, or sand storms. At the Tennis Garden, there are 3 main stadiums and 3 other outside show courts where most of the matches are played, so our guys were able to wander among them, as well as the practice courts. It was just beautiful out there, day and night. I guess Bob Farese was paying attention, because one of the amazing things about the digital pictures he sent me was that he perfectly captured some of the top players in the world in the precise key positions we identified in the presentations. Check it out. John Raiss, Dennis Avola, and Chris Donahue execute the pro positions. Over the course of the two days, I saw everyone who participated make significant movement toward the technical models we presented in one or two or all of their strokes. And we've got the film to prove it. You can check out some of the fun we had too with pictures people sent in from the Parker and from the site. The Osmosis Clinic was a big experiment for us--"We're Tennisplayer not Travelocity" was a refrain I repeated more than a few times to myself and others, while puzzling over the organizational and logistical details on the whole experience. But on the whole I think we pulled it off in grand style and created a an original and very authentic tennis experience for all involved. So much so that, yes, I am seriously contemplating a repeat performance in 2008! Stay tuned for more on that.